When one thinks of the environment of the Delaware River Watershed, Camden, New Jersey might not be one of the first locations that comes to mind. Urban areas overall tend to be overlooked as integral parts of the watershed due to the concrete sprawl and lack of green, open spaces. But, as with most situations in life, there is more than what is just seen on the surface. Cities can hide a vast array of valuable wildlife and natural resources, especially a city like Camden that sits on the banks of two important rivers—the Delaware and the Cooper. One organization in the city is taking that idea and putting it into action. Through education of the youth in the area, UrbanPromise hopes to change the perspective the younger generation has on their local environment and broaden their future horizons. In January, UrbanPromise, graciously invited the Coalition for the Delaware River Watershed team down for a day of information and touring in which we learned all the wonderful ways they are activating and engaging the youth in Camden around the natural world. UrbanPromise is a private school with classes available for grades K-12. They have recently celebrated their 30th anniversary in the region and have 20 affiliate sites worldwide including nearby Trenton and Wilmington. 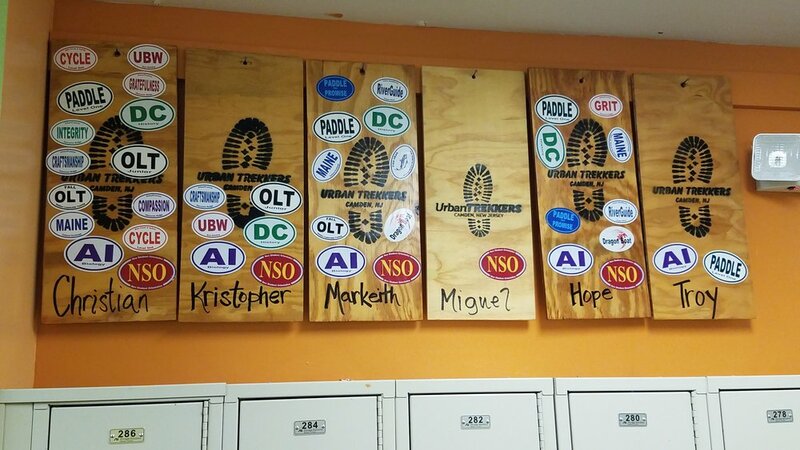 During our trip we were brought into a special office in the high school, titled the Office of Experiential Learning (OEL), where all UrbanPromise’s environmental endeavors originate from. Founded by Director Jim Cummings originally as an outdoors club for the school, the office began to expand overtime with both student and faculty support. Nowadays, the OEL runs a variety of environmental expeditions for the students of UrbanPromise, as well as having two major programs it runs—UrbanTrekkers and Urban BoatWorks. As a part of the UrbanTrekkers programs, all 60 of the high school students go on a class trip run by the OEL every year, though many students opt to do more and get further involved with OEL on additional trips and hikes. Some of the trips OEL has hosted have been to Washington D.C. and the Appalachian Trail. OEL also incorporates their programs into what the students are learning in the classroom, such as taking the History class to tour Civil War battlegrounds. These students, who previously might not have had the opportunities to explore their environment outside the city, have many opportunities to open their eyes to the vastness of what the world has to offer thanks to the OEL. OEL also grows appreciation and understanding for local environments. Alongside the multiple expeditions that are spearheaded by UrbanTrekkers every year, there is the RiverGuides program that runs along with it. Through this program, students are given the opportunity to become tour guides on the Cooper River, using canoes created by the Urban BoatWorks program. The Urban BoatWorks program teaches vulnerable youth in Camden valuable and marketable hands-on skills in carpentry and boatbuilding. Some of the canoes built can be upwards of 25 ft long! “Urban BoatWorks started with five volunteers and five kids, and now we have 20 volunteers, two staff, and (work with) five schools with grade 6 through 12, including Urban Promise,” said Tom Calisterio, founding volunteer-turned-staff member. These programs have lit a passionate fire in the bellies of many of the students who have come through them. We spoke to one student named Yasiria, a high school junior, who takes part in almost all the programming provided by the Office of Experiential Learning. With the field of environmental justice on the rise, the public is becoming increasingly aware of the ways that environmental issues like air pollution and clean water availability adversely affect marginalized communities. Despite this, the field of environmental jobs is shockingly lacking in diversity, but UrbanPromise’s OEL is changing that. Students like Yasiria now have additional options and ideas for work in the environmental sector thanks to OEL’s exposure. To learn more about Urban Promise’s work, you can visit their website by clicking here.